Moonestone Farm operates in the heart of Central Kentucky within close proximity to Gainesway Farm, Walmac, Spendthrift Farm, Castleton-Lyons, and renowned emergency veterinary hospital, Hagyard-Davidson-McGee. 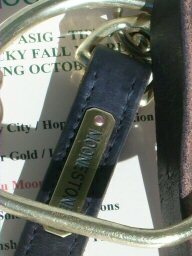 Moonestone is also in an ideal location to reach any breeding shed in central Kentucky. Our facilities include acres of lush Kentucky bluegrass, large airy stalls, round pen, six-horse walker, and well maintained, classic board horse fencing. We provide full-service board and quality care for foaling mares, maiden and barren mares, lay-ups and sale preparation for weanlings and yearlings. March 16, 2016 - Moonestone foaled and raised BERNARDINI - ONEBADKITTY colt is purchased by Spendthrift Farm for $575,000 at the OBS March sale (Hip 155). October 6, 2013 - SMARTY'S ECHO (Smarty Jones), raised/pinhooked by Moonestone, ran second in the G1 Dixiana Breeders' Futurity. September 6, 2013 - KARMA KING, raised and sold by Moonestone Farm, breaks his maiden impressively at Del Mar in his first start. August 1, 2013 - TEA DERBY and GOLDILOCKS PLANET both impressive three-year-old winners for owner John Elder who foaled and raised them at Moonestone.